We are an improv theatre. We are in the business of improvisational theatre. We make up all our comedy, plays, and sketches on the spot (unless otherwise noted). Short form, long form, Chicago-Style, NY-Style, CA-Style, Austin-Style – we do it all (especially Austin-Style, it’s our specialty). We host and produce improv shows Thursday through Sunday. For some of the shows, we invite independent groups to perform (everything you see on Thursday night, for instance) and some of the shows we personally produce (everything you see on Saturday night, for instance). Troupe – usually means a group of people who work together independently of any theater to create their own style and show. The troupes are usually made up of improvisers who have taken classes, here or elsewhere, and enjoy working and performing together. We have a one regularly performing troupe, Parallelogramophonograph (who perform every Friday at 10pm). Show – usually means a produced production with a curated director, cast, and crew. A good example is our Saturday night 8pm Mainstage shows. 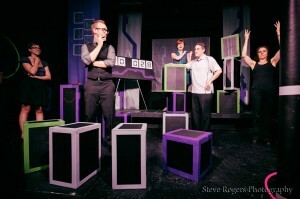 Every Saturday at 8pm you can see a full-scale improvised production. This is the bread and butter of the work we do, so we definitely recommend you checking this out. Check our calendar for information about what’s coming up next! Improv, or improvisation, is a form of live theatre in which the acting, plot, dialog, and characters of a story or scene are made up in the moment. Often improvisers will take a suggestion from the audience, or use something else to inspire them. This inspiration helps get the improvisers going, and often shows the audience that the performance is indeed not scripted. Improv is unique in that if you see a performance of it, that’s it… there will never be another show exactly like it ever done again. Improv is different every time. We teach improv to others. Students improvising in one of our many improv classes. We teach several levels of improv classes, weeknights and weekends, for adults as well as children and teens. We have new levels starting all time, just click on the “classes” link for more information. We also teach specialized one-off workshops and bring in special guest instructors. Friend us on Facebook for live up-to-date information. Our instructors live and breathe improv. 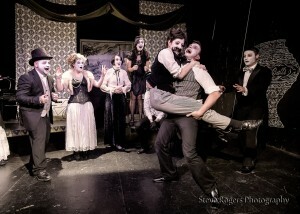 They are Hideout Theatre regular performers as well as faculty members. You’ll be learning improv from someone who has several years first hand experience both teaching and performing. We’re very picky about our faculty, because we know that if you have the right teacher, you’ll love the art form as much as we do. And have a damn fun time learning and doing it, too. We offer custom shows and workshops for company events. We’ve worked with hundreds of businesses and event coordinators to give their conferences, parties, and gatherings the exciting and infective energy of positivity, productivity, and fun that only improv can bring. Click on the “corporate” link for more information and examples of what we can offer you. We are in Downtown Austin. 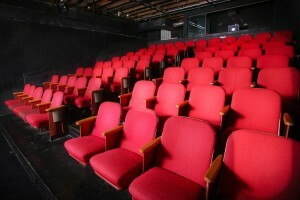 The seats and risers in our ground floor theater. 617 Congress Avenue, to be exact. The southeast corner of 7th and Congress, to be more exact. latitude: 30.268567, longitude: -97.74216, to be stupidly exact. We’ve been downtown for all of our life. 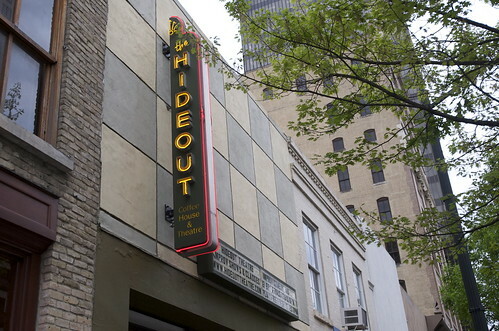 We’re one of the few options for live entertainment downtown that doesn’t involve drinking until you pass out, or destroying your eardrums with mind-numbingly loud music. Aden, one of our Hideout alumni. By its very nature, improv is funny. And our shows are hilarious and delightful. Just ask our thousands of patrons. But improv can be so much more. Evocative. Sad. Cathartic. Shocking. Moving. Stylized. Theatrical. Purposeful. Experimental. It is our mission to explore what improv is capable of, in every way we can think of. Come check us out to really know what we’re all about. We have shows every single weekend, all year long, and we have something for everyone.